It all began with the third international Open Source Content Management (OSCOM) conference at Harvard University's Berkman Center for Internet and Society in the spring of 2003. Dave Winer, the creative genius and enfant terrible of the blogosphere, was invited to give the keynote address to a couple hundred Open Source CMS developers from all over the world. As the architect of several Web standards like XML-RPC, SOAP, and RSS, Winer garnered enormous respect from his developer audience. Working with Professor Charles Nesson, the founding director of the Berkman Center, Bob Doyle was one of the organizers of the conference. The Desktop Video Group videotaped all the major presentations. Bob got to know Winer pretty well along the way. At the OSCOM conference, Bob met Christopher Lydon, the longtime television and radio personality from the Boston area, who was a Fellow at the Berkman Center. Chris did a long stint as television anchor for the Ten O'clock News on WGBH Channel 2. After a failed run for mayor of Boston, Lydon switched to radio and created The Connection at Boston University radio station WBUR. One of the early talk shows syndicated widely across the country, The Connection was the sparkplug in a fund-raising drive that raised WBUR from a $5 million a year operation to $25 million per year. At that point Lydon had locked horns with WBUR management over the rights to his content, specifically long-term rights to his shows playing over the Internet. A close reading of his contract by the station manager, Jane Christo, and Boston University president, John Silber, showed that as a WBUR employee Lydon had no rights to his work, and he was summarily fired. Lydon came to the Berkman Center for Internet and Society at Harvard. Dave Winer had also come to Harvard as a Berkman Fellow. He organized the 2003 BloggerCON meeting of his fellow bloggers. It was a great success. Click on this image to open a big composite panorama of Day 1 at BloggerCon, from Big Dave Winer on the left, to Chris Lydon holding a microphone and me videotaping in the center, to Charlie Nesson on the right. 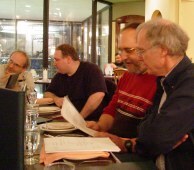 Thanks to Dan Bricklin for the original pictures we stitched together and the shot of me and Dave at dinner afterwards. Winer urged Lydon to write a blog to restart his career. Lydon said his gift was a radio voice, not merely a skillful pen, and Winer suggested that Lydon come to the Desktop Video Group in Cambridge, the former NewMedia Lab, to see if there was a way we could create an audio blog. Starting in July, we investigated a bunch of portable recorders, audio editing software, and compression tools, and taught Lydon to use them all. 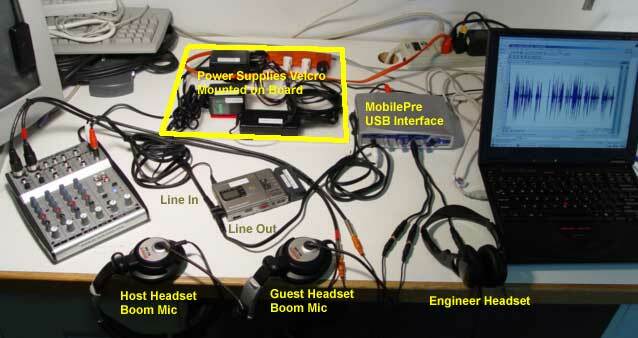 We launched BlogAudio.org to document the research, especially Chris Lydon's Portable Web Studio. 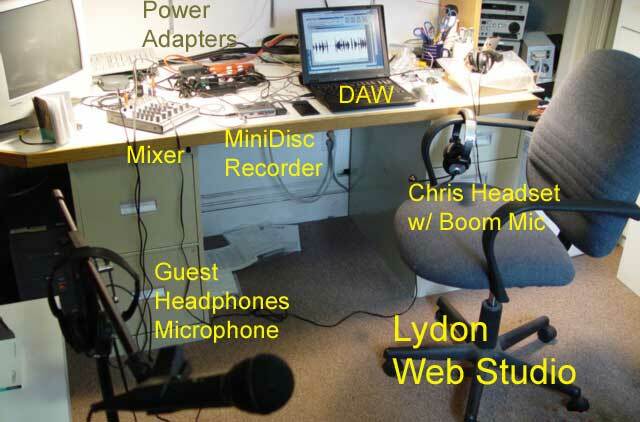 After 25 years of being surrounded by the cream of broadcast engineers in state-of-the-art studios, Lydon was alone with his recorder, a laptop editor, and tools to upload audio to a media server. He self-produced more than 50 interviews, posting a text description to the Harvard weblog that Winer built for him, with an audio link to my media server at skyBuilders.com. We described the new technology on the Web site BlogAudio.org. The DAW is Chris' digital audio workstation. The screen shows the sound editing software that Chris used to sweeten the sound of his shows. "Chris Lydon never sounded so good," he said, after one all-night editing session. Chris, his producer Mary McGrath, and David Weinberger in Chris's studio at DTV Group after David's interview. Chris wears his headset and David is sitting at a studio microphone. In September, Winer, also a Berkman Fellow, created a special RSS-with-enclosures feed for Lydon's Harvard weblog, which previously had a text-only RSS feed. Lydon, a former New York Times reporter and NPR talkshow host, posted his in-depth interviews with bloggers, futurists and political figures, which Winer gradually released to the feed. Announcing the feed in his own weblog, Winer challenged other aggregator developers to support this new form of content and provide enclosure support. In October, Winer and friends organized the first Bloggercon weblogger conference at Berkman Center. CDs of Lydon's interviews were distributed as an example of the high-quality MP3 content enclosures could deliver. Bob Doyle demonstrated the portable studio he helped Lydon develop; Harold Gilchrist presented a history of audioblogging, including Adam Curry's early role, and Kevin Marks demonstrated a script to download RSS enclosures and pass them to iTunes for transfer to an iPod. At the BloggerCon, Winer got Lydon involved in the great debates between journalists and bloggers. Lydon had been one of the "guys in the back of the bus" writing for the New York Times in presidential elections from Kennedy to Carter. Another of the BloggerCon attendees who visited DTV Group was Adam Curry, a top host during MTV's early years. On his daily commutes, he lamented his inability to listen to his favorite talk shows (like Lydon's), and wrote some software to automatically download archived shows from the Web into his iPod. He, Winer, and others extended RSS feeds to include audio attachments. Now iPod owners could use blog aggregation software to fill up their portable recorders every day. Thus began the explosive phenomenon of podcasting. Winer recently recollected the earliest Lydon podcasts on scripting.com. Dave uses the composite panorama I made from Dan Bricklin's photos. There I am with headphones on the left making the video recording. Charlie Nesson is off on the right. Dave left out Chris Lydon holding the microphone. Chris did a recent interview with Wired.com that completely erases my contribution, the portable studio I built him (used for his interviews), and attributes the first podcast recordings to the Berkman Center! "I leapt at the chance to record there," he says. As Lydon describes the birth of his new blog, "Winer says the first podcast in human history was the interview I recorded with him in July, 2003 and posted on Bob Doyle's server at skyBuilders.com. It was the stream of subsequent RSS-fed interviews on my blog that landed in Adam Curry's iPod in Europe and fired the imagination that launched iPodder." In November, one year before the 2004 election, Sterling Newberry and Matt Stoller launched a website for Christopher Lydon called "The Blogging of the President" and another called "BOP News." Neither site is still serving. But Chris used the theme for a show at Minnesota Public Radio.